I just spent a relaxing week at the beach with my husband and family and I'm looking forward to blogging all about it within the next few days, but before I even got to upload my vacation pics to my computer, you know I had to get back into the kitchen... my kitchen. There's no place like home. We got up bright and early to pack up the car and head back home (our vacation spot was a mere 90 minutes from home) and we arrived in time to run all of our favorite errands (grocery shopping, library, Costco) before noon. As much as I enjoyed eating out at fun restaurants at the beach, I was craving some grilled foods. We grilled our usual this afternoon: Nathan's beef franks, shrimp seasoned with Old Bay, filet mignon (small portions, since I don't eat much beef), chicken kebabs, and a nice corn and squash saute (compliments of my mom). As I loaded our groceries into the fridge I noticed we had a few old Gala apples in our fruit drawer. I cut up a few and had them as a snack with some cheese while I enjoyed a glass of The Show Malbec (which I tasted for the first time back in June at the Joel Gott Wine Dinner). Then it hit me... I'd make a cobbler! My kitchen was a mess and I couldn't find my camera, so I whipped this one up and just snapped a photo with my BlackBerry (above). I wasn't sure how it would turn out, but my mom, brother, husband and I ate the entire cobbler in one sitting. I whipped up some fresh sweetened cream on the side (because I didn't have any ice cream) and it was really nice. Best part? It's super easy and you can use this technique with almost any fresh or frozen fruit. The star ingredient is self-rising flour (but if you live up North and can't find it in the grocery store you can make your own). It's a great last minute dessert. I've done this with blackberries, blueberries, cherries, and peaches. I've adjusted the spices and sugar to suit the fruits. Who doesn't like fresh fruit baked into a sweet, buttery crust? Try this one. Even if you're a non-baker, you can do this! Keep it in the fridge until you're ready to serve dinner, then let it bake during the meal. Serve it hot from the oven with some vanilla ice cream or fresh whipped cream and you'll be a rock star. Pour melted butter into the bottom of a 1 1/2 quart baking dish. Whisk together the flour, sugars, and spices. Whisk in the milk. Pour this batter over the melted butter. 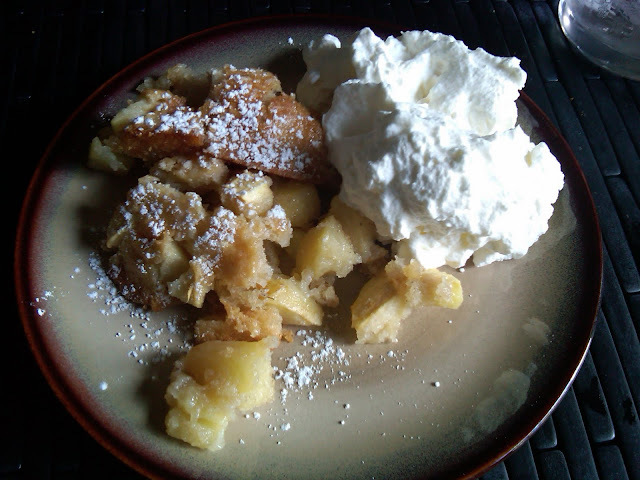 Spread apples evenly over the batter. Do not stir. Bake for 35-45 minutes, or until crust is golden brown. Serve warm with vanilla ice cream or fresh whipped cream. I'm not much of a baker, but this is simple enough and sounds tasty. i'm thinking peach cobbler. oh yes! Okay, sista! I'm making this tonight with peaches. Looks easy enough to whip up in between dinner & homework help.